Do You Refrigerate a Cake After Dirty Icing and Before the Fondant? Add edible flowers or pearls to complement the smooth buttercream icing. 3 Do You Refrigerate a Cake After Dirty Icing and Before the Fondant? Making a wedding cake trims wedding expenses in exchange for your time, patience and practice to achieve a professional looking cake. Tiered wedding cakes are traditional, elegant and provide enough cake to feed between 100 and 300 guests, depending on the tier sizes you use. Tiered cakes require planning to ensure the cake remains stable throughout the reception, without collapsing or tilting. 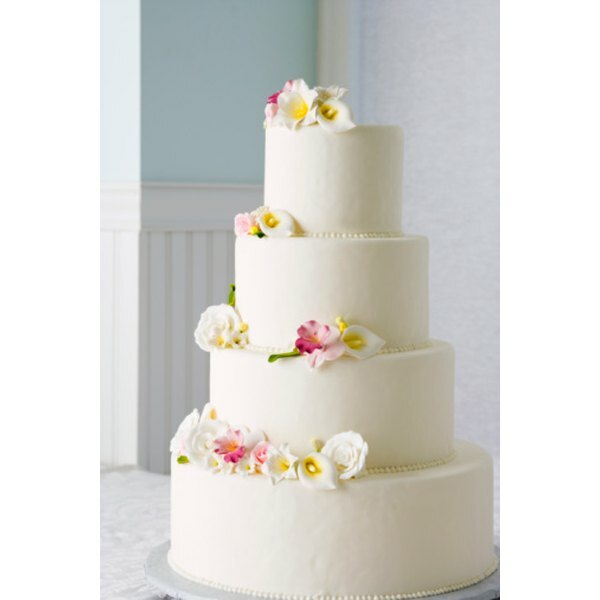 Buttercream icing is a simple icing to make yourself and works well to crumbcoat, fill and decorate wedding cakes. Bake cake according to the recipe's directions. Bake two cakes of each size, each pair of cakes will be used to create one tier. 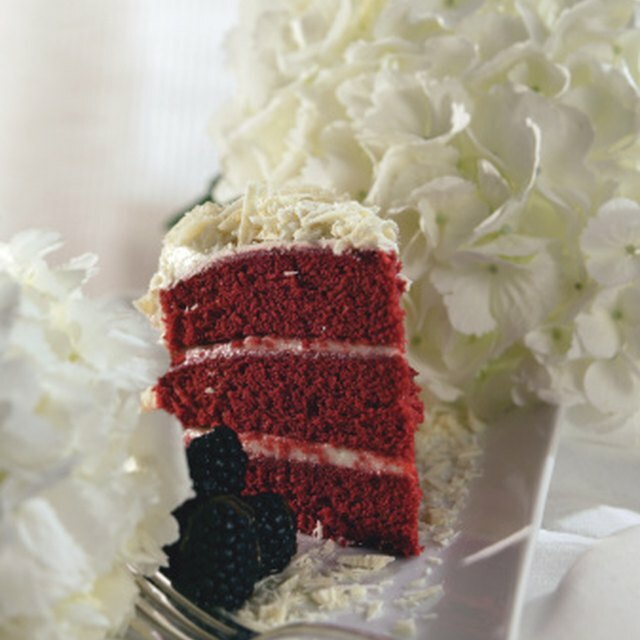 Each pair of cakes should be the same flavor but tier flavors can vary. After baking cool cakes completely on wire cooling racks. Trim the top of each cake, using the serrated knife or cake leveler, so that it is level and the next cake can sit flat on top. Crumbcoat each cake with buttercream icing using an off-set icing spatula. A crumbcoat is an even thin layer of icing applied to each cake to catch cake crumbs so an even layer of icing can be applied on top that will look clean. Assemble each tier. Pair cakes by size; apply filling between each pair and crumbcoat the stacked pair together to create one tier. Repeat for all eight cakes, creating four tiers you need for the finished wedding cake. Measure and cut 12 pieces of dowel to the height of a cake tier. The dowels help support the cake, keeping it sturdy and straight throughout the reception. Arrange four dowels, per tier, into a square shape and insert into each tier, except for the top tier. The length between each dowel should be equal for proper weight distribution. Firmly press the dowels into the cake until each dowel sits flush with the cake top. Ice each tier with buttercream. Smooth flat using an uneven spatula or professional icing smoother. Add texture by pressing a quilted paper towel over the icing or use a plastic cake edger to create lines or ribbing on the edges of each tier. Place the largest tier carefully on the center of the cake board. Center the next largest tier over the support dowels placed in the bottom tier, distributing the weight of the tier evenly over the bottom tier. Repeat with the third and top tiers, the wedding cake is now assembled. Fill a piping bag with buttercream frosting. Pipe edging, using buttercream, along each tier as well as draping or flowers for decoration. Buttercream icing can easily be colored using food coloring, if you prefer a splash of color instead of an all-white cake. Each tier should be at least 2 inches smaller than the one underneath; for example, 12-inch bottom, 10-inch second, 8-inch third and 6-inch top tier. Plastic dowels are larger than wooden dowels and take up more room, which means your cake will have fewer servings.